After the past couple of weeks of somewhat inclement, to downright ugly weather, we had been thinking about another day down to the WTP. Not in the fog, most said, so we looked with interest at the little icons that the tv folk put up for weather, and even went to BOM to get a broader picture. Tuesday looked the go, but, as usual with all good plans, important things came up, and so Tuesday came and went. However Wednesday promised even better, and a nice *definition – not to strong* northerly wind to go with it. Which meant a little interior warmth coming in, so goodbye fog. We picked up Mr An Anoymous and headed down for the afternoon. As predicted the wind was blowing toward the water and the big birds seemed to delight in it, and it quickly became a raptor day out. Which is good, as I’ve been wanting to give the new Wimberley Gimbal head a real work out, and see if it makes me look like a birds inflight photographer. I’ve raved about it before, but now with good reason. I delayed, I think I’ve said this before, buying the real thing just because they are expensive. And they are. But, you’ve got to think laterally on this, one Wimberley will last a lifetime, produce rock solid pictures day in day out, and save your tired old arms from holding the long lens up, and then just at the crucial point nerve jitters sets in and he images are blurred. Yep I know Image Stabilisation, Vibration Reduction, get with the times mate, move on in life, spend even more money. But, good as VR is, its as many limitations as it has advantages, and I’ve really grown to like the 500mm f/4 especially on the D7100- with its real focusing mechanism. It looked however a bit quiet as we rolled down Paradise Road. 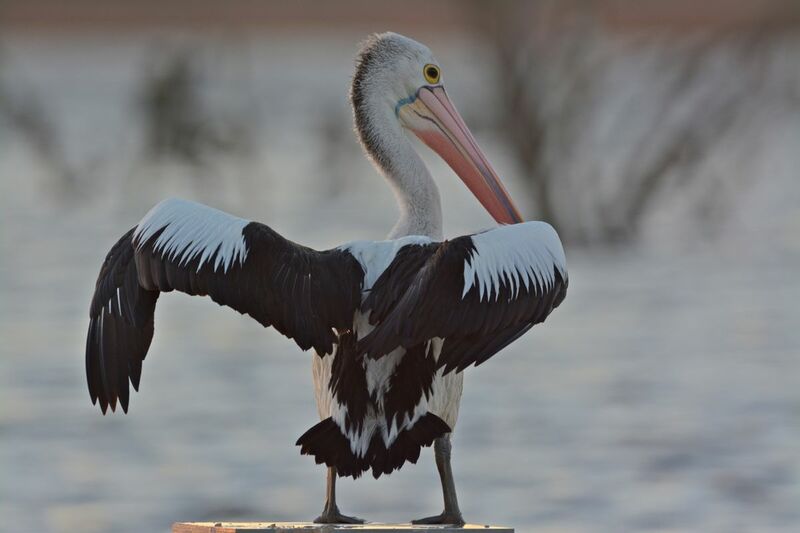 A quick look for the missing Northern Shoveller, but no sightings. We did find a large flock of Pink-eared Ducks in a pond up toward The Borrow Pit, and settled down behind a couple of small trees near the waters edge and 15 minutes later had some great shots of the ducks as they paddled past, filtering water at a great rate of knots. I’d not really noted before, but the water is a constant stream, flowing out just at the base of the bill. They must sift a lot of water in one day. To our amazement a little further along the line we found about 30 Black Kites in dance in the air. Most looked like juveniles, but masters of the stiff breeze they were and me and the Wimberely were in Inflight heaven. After so many passes by the birds my arms were tired only from pushing the camera around. Great start. Then a Brown Falcon decided that if it mixed with a flock of Ibis, then it might not be noticed. The Brown Falcons seem to be a bit of target practice for the bigger birds at the moment. Geoff Main on Flickr has a series of Kite vs Falcon, and there is another report of a Black Falcon taking the prey from a Brown. So maybe this Brown sought a bit of shelter. 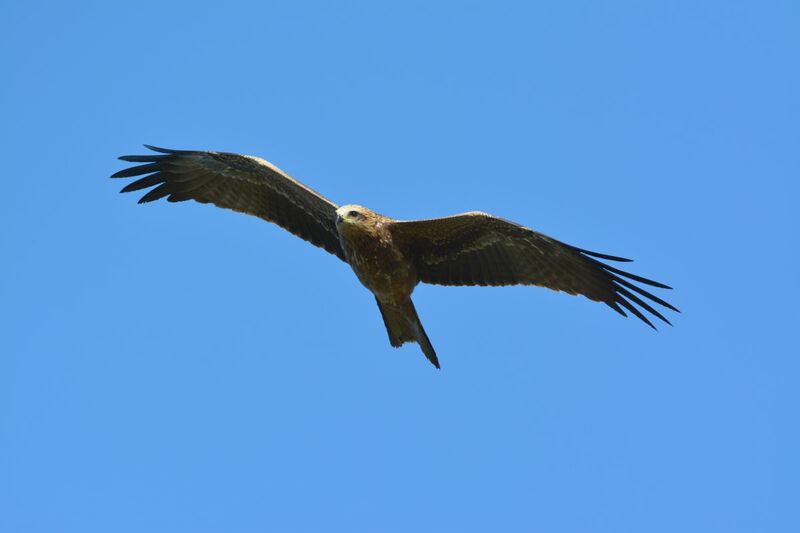 Further on, and a Whistling Kite was making short work of someone’s family member and calling out to all and sundry to announce its feeding. 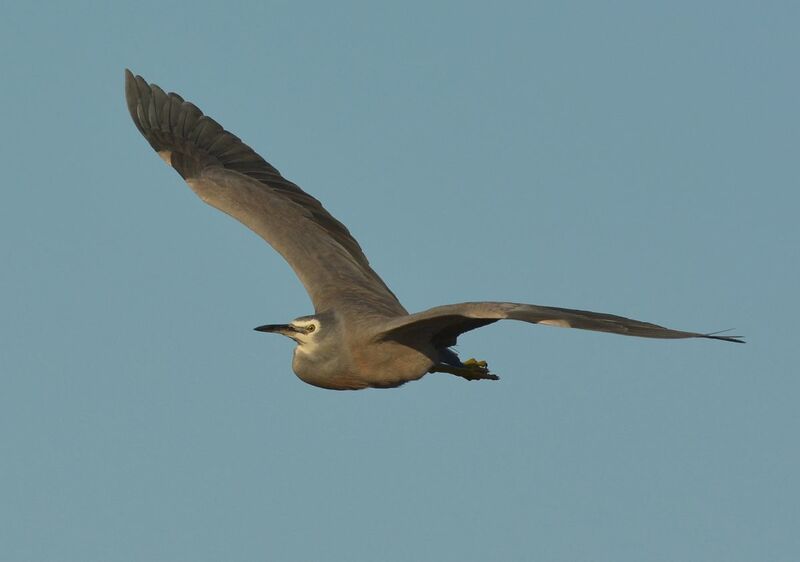 Some Cape Barren Geese along Lake Borrie kept us busy for awhile an even had the male come advancing toward us wings displaying. Don’t think he liked the little grey car. And out on the Murtcaim (n) outflow the four Brolas made a brief appearance until just about being run over by a cross country rally expert in a 4WD, not sure if he was a birdo or just needed to get home early. Hope he made it. The Brolga took off and went to a safer paddock. Back along Beach Road, and it was the turn off a pair of Black-shouldered Kites to show they were serious and one took a mouse pretty much infront of the car. Three people with cameras going ‘Ohhhh”, not shot taken. Then just as the sun was setting and we were already in going home mode, around the corner on Paradise Road. A Hobby sitting in what was definitely the last of the evening sun. And the light was gone. It however let me get the car up close enough so that a shot or two through the open window was possible. 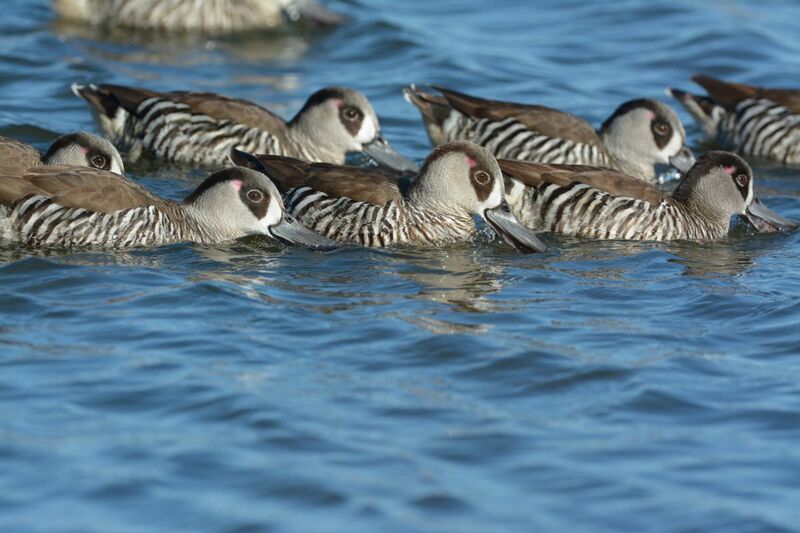 Pink-eared Ducks hunting in line. Black Kite, one of about 30 in a flock. Nice catch. 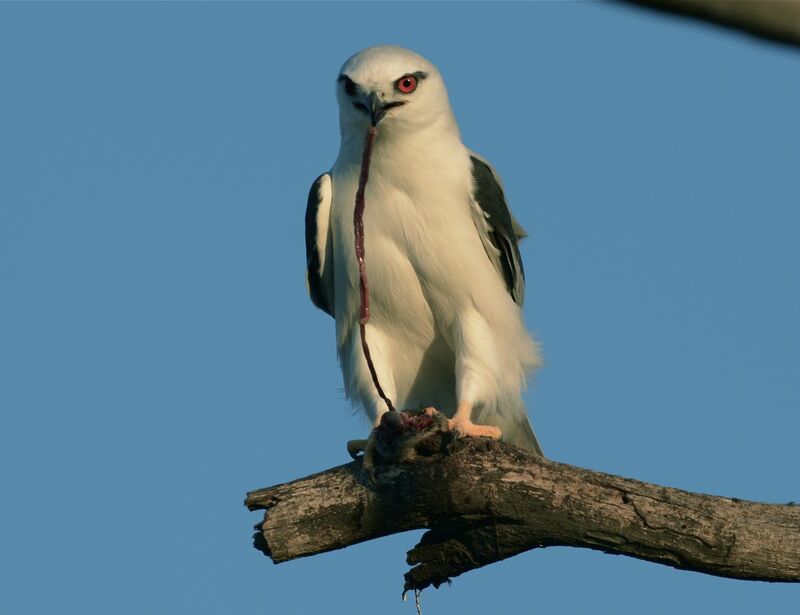 Black-shouldered Kite taking a late evening snack. Mr Percival’s relation sitting in the late even sunshine, warming it all up for the night. Hobby in the very last rays of the evening sun. Can only imagine how good these might have been if we’d been a few minutes earlier. 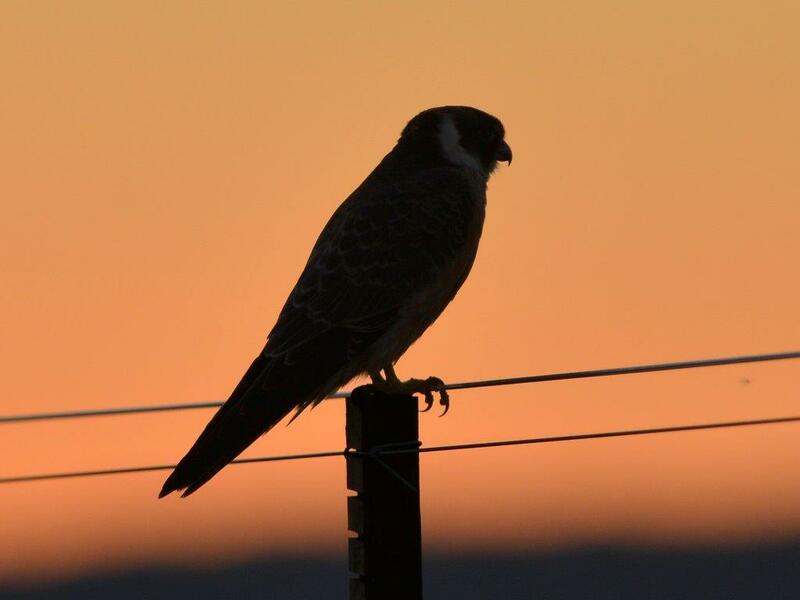 Here’s one of the Hobby in silhouette by Mr An Onymous. 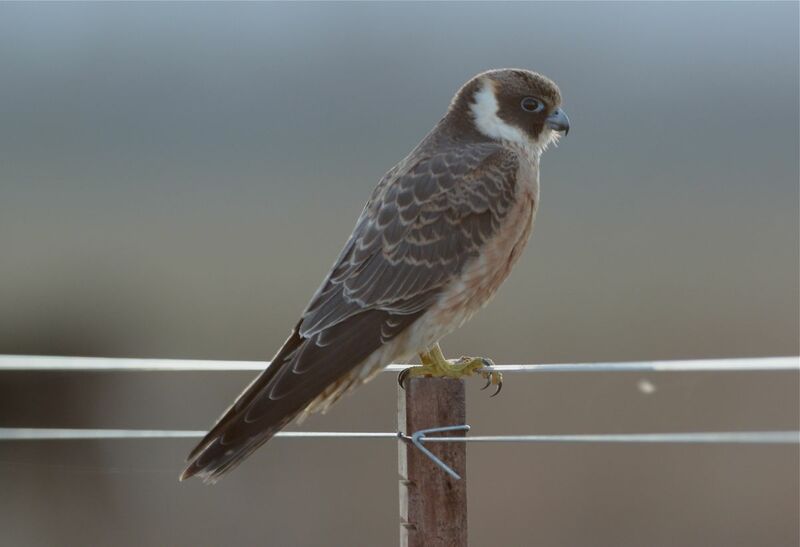 All great shots Dave, but the Brown Falcon is the stand out pic in my opinion. It has a dynamic quality that the others don’t. G.day Rodger, Thanks for that. I had a good few minutes with said Falcon, there is another better wing display that I’ll put on Flickr in the next day or so. Think I agree, but I shot over 300 images this day and have to be honest, its the best range of keepers I’ve done down there this year. Also started some Swallow Shots, but think I’ll need a bit more practice. I always enjoy your little stories, David reading them on my phone I was there yesterday too, alas in the morning on my way to Geelong. I was probably the first car to go through the gate and I was hoping for some great raptors action. I did see some in the distance, but way too far, apart from a pair of black-winged kites. I had only one hour and thought all the time of you as you had said once that you prefer afternoons at WTP. So right! G,day Adam, but you still had a good day. And that’s the main thing. Personally I prefer the morning light down there. It comes at a wider angle on the roads, and you don’t get blinded. But, in winter, its a bit further north, so can be a problem as you drive in, because you flush everything into the backlighting. So we generally plan to go as far in as possible, turn round and the drive back with the “Light over our shoulder”. Its a good scheme until one of the passengers gets all excited and we stop. Here, and there, and over there, and .. So we don’t get to the ‘starting point’, until late in the morning. Afternoon is great unless you are driving back into it. Which you are on the way out! So, we’ve compromised, and get in around lunch time, look about and then drive further into the plant with the sun a bit behind us. And the late evening rays of light are well worth the wait. But you run out of time real fast. If we go down the Spit, then its either or, and then we figure out the best time for low tide at the Murtcain (m) outlet. Either way as Mr A says, any day out birding is a good day. If we see birds, its even better. G,day Christine, Glad to learn you enjoy the ramblings. sometimes there are really cool things to say, and sometimes the birds just dominate. They certainly did this day. 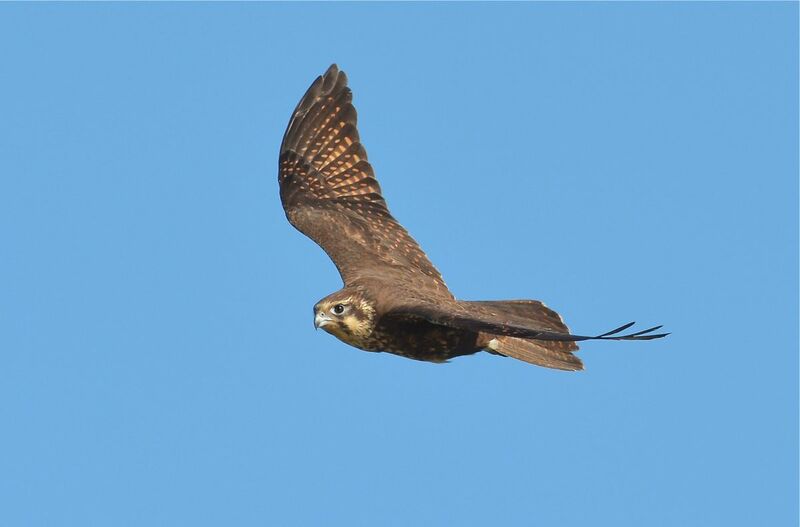 I agree with Rodger, the Brown Falcon picture is a beauty. 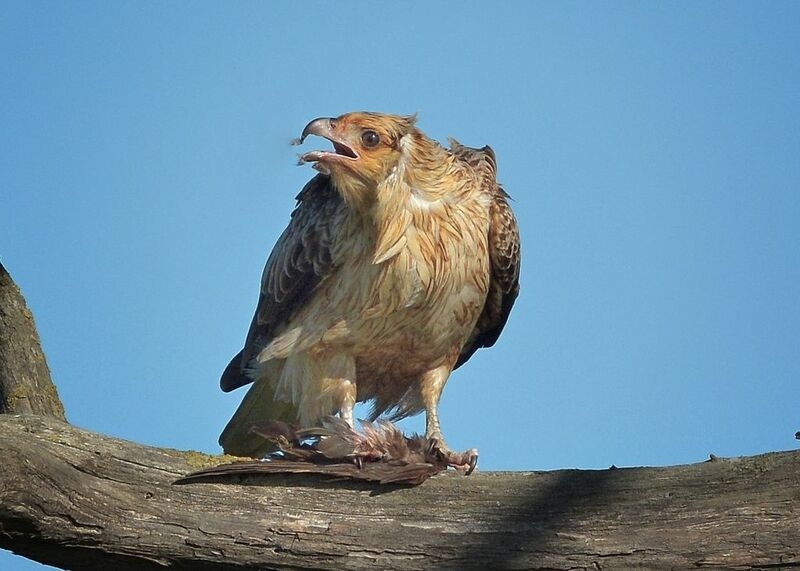 The Whistling kite with prey looks great too. BTW, I have had my Wimberley for 12 months now and I have learnt that to go shooting without it is a big mistake as disappointment reigns every time. My set up is heavy, I am not that big, but now, would rather carry the extra weight and awkwardness than shoot without it. I have tried my older, lighter lenses for carrying in the field and yes it is more comfortable but oh so disappointing when reviewing later. Now that I have used the heavy good lens, tripod and Wimberley, the resulting pictures make it all worthwhile and it has spoiled me terribly. Hand holding just doesn’t “do it” for me any more, I just won’t bother. I have found the Wimberley is not only good for birds in flight, but for all bird photography due to the way you can follow that bird around the tree so easily. Sometimes I get good results from a beanbag or ledge or out of the car window, but always with the good lens. I believe the advice that I received when I first began (that I initially, did not listen to) really is correct. That is- to buy the very best that you can afford. Even if you are a learner and wannabe like me, it really does pay in the long run! Thanks for the note. I’ve another Brown Falcon shot, just turned a bit more, I’ll probably put up on Flickr, it really shows the beauty of the wing and mantle markings. I wish I too had listened, but off course I knew better, and probably have spent enough in inferior look alikes to buy at least one more Wimberley and shout a free one to a friend. I don’t handhold small birds, but I do use a Markins Q20 ball head on a smaller manfrotto tripod, never extends much over 70cm. The rig is lighter for my small birds in grey forest stuff. It does not do birds in flight. It is hard to say what the Wimberley does. But what ever it is it does it so well. It keeps the camera steady, takes the weight of my arms, is instant to follow a bird and somehow or other after a few uses it just feels right. All over right. Put the money into good glass, and the camera bodies will come and go. I used to have a 25 year old manual focus 600mm f5.6 lens. (I got it second hand). But, its sharpness, its focus, and handling, were a real treat. The first year I followed Kestrels it was my main lens. Anyway thanks for the update, hopeufully all photographers in the future will be born with a Wimblerley head.